Elaine Adair Pieces: What a Groupie I've Become! Yes, Bonnie of Quiltville.com is so brave to attend a Quilt Show, give a Trunk Show, and teach several classes, waaay out here in God's COLD and usually WINDY country. I'm signed up for a Sunday all-day class of Pineapple Blossoms, along with 2 friends who are driving with me. This is still a long way from my home, almost 4 hours each way. We are hoping the weather cooperates. I've following Bonnie's blog for many years and my quilt supply indicates how many of her ideas I've used for my quilts. IMHO, projects done in a retreat or some classes should not be difficult. You will have a different chair, lighting, the iron is in a new place, your seat is too low, there's a glare, the cutting mat is too large for the space, you are a 'righty', but your space may be a 'lefty', etc. This is a great project - not too demanding. 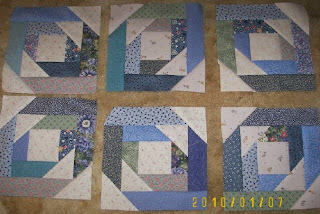 In my enthusiasm to get my pieces prepared, I started sewing, and already have 14 of the 36 blocks made. Can't help it! I made a few in browns, but the blue won out, and I made one dorky/wrong one. It always helps to make a practice block. I had to BEG (OK, he offered) DH's 4 wheel drive vehicle, but then something recently happened to the transmission - scarey noises! OK, off to the shop and fortunately it wasn't as bad as we were worrying about. Can you believe that in the transmission parts, under the vehicle, there is a rubber seal, around PLASTIC! For Gosh Sakes! We don't do much 4 wheel driving, but really, PLASTIC! My pinched nerve is an ongoing issue -- sooooo, I'm careful. Chiropractic treatment and traction are helping, but I have many months of treatment ahead of me. Even as I sit here, I can hear my neck going 'critch' 'critch' 'critch'. Between the every other day Dr. appts, and poor sleeping, my energy levels are in the pits! Fons and Porter are on Public TV this AM (Love of Quilting) so I'm off to enjoy! Oh, yuck! I'm so sorry to hear the pinched nerve is still...pinching. You are so brave in my book to be traveling 4 hrs each way in THAT kind of weather with that nerve and all. I hope it all goes well! Love the pineapple blossom pattern. I keep promising myself that I will make it up one day, but "one" day has not yet come. Have fun! Lucky you (the quilt class with Bonnie Hunter, not the sore neck). I have followed her blog for years too. I hope the neck problems eventually get solved. O have a really good time! I don't do Casper in the winter. No, no I don't. Just getting there is a scary proposition. Your blue blocks look great.Have a good time in Casper. Enjoy the class with Bonnie. Take care of your neck and have a good and safety trip. I have wanted to make that quilt too. Yours will be lovely in blue. Have fun at class! Oh you are so lucky!!! Getting to met and take a class or 2 from Bonnie!! Wow, mother nature better cooperate! Hope you feel better soon! Have a very safe trip. I'm sure you'll have a great time in class. Oh, you will so enjoy your class with Bonnie Hunter. I took a class with her a little over a year ago and was blown away by her energy and enthusiasm, not to mention her knowledge. And her truck show made me tired: so many really big quilts with so many little pieces of fabric. have fun! How fun to go to a retreat with Bonnie as the presenter- I am sure you all will have a wonderful time. Hope that your neck is feeling better so that you can truly enjoy the retreat. Have fun, be careful, and pray you don't need the 4 wheel drive. Pack extra clothes, your sleeping bag--you know the routine!! AND DON'T FORGET THE CELL PHONE CHARGERS!! Your Pineapple Blossom is going to be beautiful! How wonderful to be taking a class with Bonnie. I'm envious! Yes, please be careful and don't overwork those neck muscles. You will have a great time! ENjoy every minute! I'm jealous that you're meeting Bonnie and getting to work with her! Hope the weather and your neck do cooperate and you get pics by the handful! I would be happy if we even had quilt people on TV here, but we dont! I cannot relax or read or anything, I am so strung out. The only thing I have been trying to do is watch DVDs to avoid thinking of Gom. OH Baby! I'm so jealous! You will just love her class and trunk show! Re: your plastic car part. They'd make the whole thing out of plastic if it would pass the crash tests. Lovely blue blocks - this will be so fresh and pretty. Enjoy the class but be careful, even with four wheel drive it might be rough going. You are brave to set out in the cold on that kind of trip. I am SO jelaous! ENJOY every minute, you deserve it! I am drooling with envy. A quilt class with Bonnie Hunter. My gosh, and you are driving four hours in winter weather to get this class. And, you have almost half of your blocks done already! What a quilt trooper you all are. Be careful. Return safely. Dang that pinched nerve my friend. Just dang that thing. And yeah, what's up with that plastic thing! Plastic. Sheesh. On a 4WD. Sure don't make 'em like they used to. Guess they can't afford it, ha? :) Being facetious there. Mainly though, I'm enjoying with a big-hearted high mountain song of joy that you're going to spend time learning and experiencing time with Bonnie. Fantastic! Anticipating nothing but wondrous things for you, Elaine!